” (In 1955) I (gave) my first poetry reading with Allen Ginsberg, the Zen poet Philip Whalen, Gary Snyder, and the American surrealist poet Philip Lamantia, The reading was in October 1955 at the Six Gallery in San Francisco. 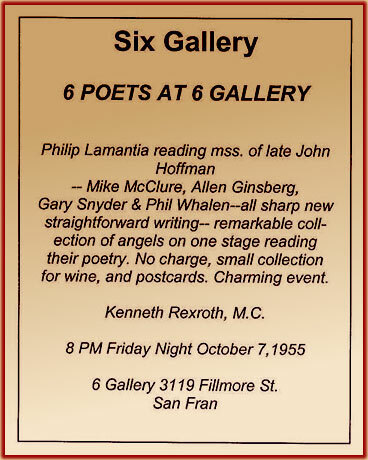 The Six Gallery was a cooperative art gallery run by young artists who centered around the San Francisco Art Institute…. On this night Kenneth Rexroth was master of ceremonies. 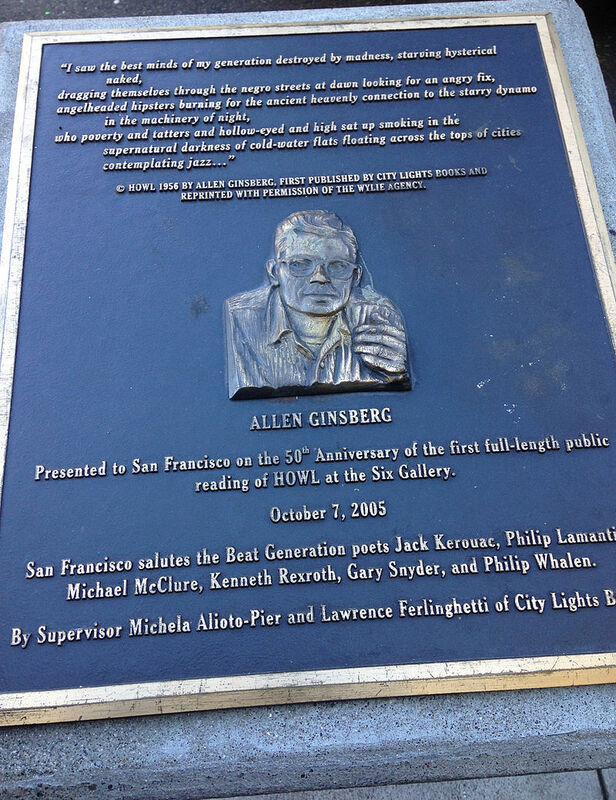 This was the first time that Allen Ginsberg read “Howl”. Though I had known Allen for some months preceding, it was my first meeting with Gary Snyder and Philip Whalen. 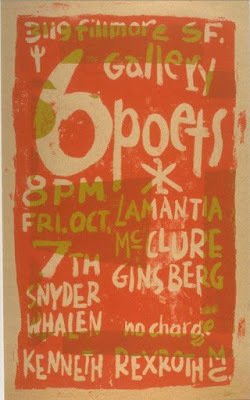 Lamantia did not read his poetry that night but instead recited works of the recently-deceased John Hoffman – beautiful poems that left orange stripes and colored visions in the air. The world that we tremblingly stepped out into in that decade was a bitter, gray one. But San Francisco was a special place. 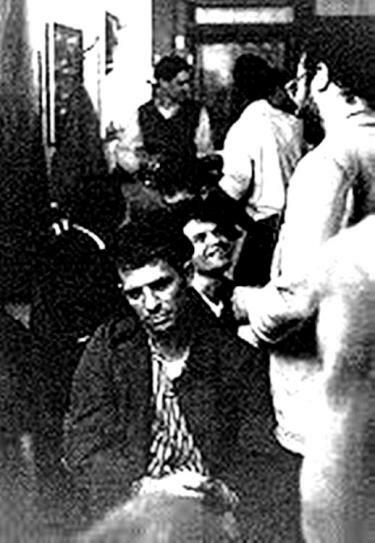 Rexroth said it was to the arts what Barcelona was to Spanish Anarchism. Still, there was no way, even in San Francisco, to escape the pressures of the war culture. We were locked in the Cold War and the first Asian debacle – the Korean War. My self-image in those years was of finding myself – young, high, a little crazed, needing a hair-cut – in an elevator with burly, crew-cutter, square-jawed eminences staring at me like I was misplaced cannon-fodder. We hated the war and the inhumanity and the coldness. The country had the feeling of martial law. An undeclared military state had leapt out of Daddy Warbucks‘ tanks and sprawled all over the landscape. As artists we were oppressed and indeed the people of the nation were oppressed. There were certain of us (whether we were fearful or brave) who could not help speaking out – we had to speak. We knew we were poets and we had to speak out as poets. We saw that the art of poetry was essentially dead – killed by war, by academics, by neglect, by lack of love, and by disinterest. We knew we could bring it back to life. We could see what (Ezra) Pound had done and (Walt) Whitman and (Antonin) Artaud, and D.H.Lawrence, in his monumental poetry and prose. The Six Gallery was a huge room that had been converted from an automobile repair shop into a gallery….A hundred and fifty enthusiastic people had come to hear us. Money was collected and jugs of wine were brouoght back for the audience. I hadn;t seen Allen for a few weeks and I had not heard “Howl” – it was new to me. Allen began in a small and intensely lucid voice. At some point Jack Kerouac began shouting “GO” in cadence as Allen read it. In all of our memories no one had been so outspoken in poetry before -we had gone beyond a point of no return. None of us wanted to go back to the gray, chill, militaristic silence, to the intellective void – to the land without poetry – to the spiritual drabness. We wanted to make it new and we wanted to invent it and the process of it as we went into it. We wanted voice and we wanted vision…. …Ginsberg read on till the end of the poem, which left us standing in wonder, or cheering and wondering, but knowing at the deepest level that barrier had been broken, that a human voice and body had been hurled against the harsh walls of America and its supporting armies and navies and acadamies and institutions and ownership-systetms and power-support bases..
& McClure, (in a 2008 reading at UC Berkeley), recalls the Six Gallery and reads three of his poems from that night. 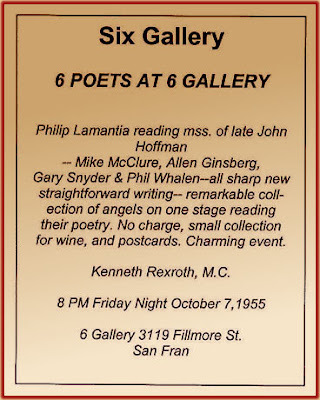 “Anyway I followed the whole gang of howling poets to the reading at Gallery Six (Six Gallery) that night, which was, among other important things, the night of the birth of the San Francisco Poetry Renaissance. Everyone was there. It was a mad night. And I was the one who got things jumping by going around collecting dimes and quarters from the rather stiff audience standing around in the gallery and coming back with three huge gallon jugs of California Burgundy and getting them all piffed so that by eleven o’clock when Alvah Goldbrook [Allen Ginsberg] was reading his, wailing poem “Wail” [“Howl”] drunk with arms outspread everybody was yelling “Go! Go! Go!” (like a jam session) and old Rheinhold Cacoethes [Kenneth Rexroth] the father of the Frisco poetry scene was wiping tears in gladness. Meanwhile scores of people stood around in the darkened gallery straining to hear every word of the amazing poetry reading as I wandered from group to group, facing them and facing away from the stage, urging them to slug from the jug, or wandered back and sat on the right side of the stage giving out little wows and yesses of approval and even whole sentances of comment with nobody’s invitation but in the general gaiety nobody’s disapproval either. It was a great night. O this is celebration enough for twenty worlds!